Utopia and the Village in South Asian Literatures provides a searching exploration of twentieth-century literatures of the Indian subcontinent by refocusing attention on works that engage with the village and the rural as a trope. Anupama Mohan breathes new life into Michel Foucault’s notion of heterotopia and continues a conversation with thinkers of utopia about the need for recuperating the utopian potential in postcolonial writings. Gerardo Serra believes that the book has the potential to enrich the perspective of development scholars who are interested in the complexity and the dynamism of the rural village. Utopia and the Village in South Asian Literatures. Anupama Mohan. Palgrave Macmillan. Utopia and the Village in South Asian Literature presents a fascinating analysis of the relationship between the rural village as a literary trope and the concept of utopia, by looking at its cultural and political configurations in the twentieth century history of Indian and Sri Lankan literatures. Author Anupama Mohan is a literary scholar researching in the fields of postcolonial thought, gender, and world literatures, who has also published a collection of poems, beside several academic contributions. The book, divided into five chapters, begins with an introduction presenting the persistence associated to the notion of utopia, meaning both a ‘good place’ and ‘no place’, pointing out the tension between ‘ideal’ and ‘unachievable’ which has given the term much of its contentious nature. Mohan calls for a reassessment of the notion of utopia and its counterpart, dystopia, in the light of the notions of heterotopia and homotopia. The former, largely inspired by Foucault, ‘subsists in the intersection between difference (other-space) and alterity (another space)’ (p. 15), while the latter comprises ‘those visions of unified collectivity where an aggressively homogenizing impulse operates and where unity is a form of collective gathering of one or two coordinates (race/language/religion) and the deliberate repudiation and exclusion of others’ (p.9). The two streams of literature, dealing with the Indian and the Sri Lankan village respectively, are presented as evolutions departing from two canonical works. Gandhi’s Hind Swaraj, (chapter 2) published in 1908, systematized his vision of Indian development based on the village and the rural in opposition to the city and industrialisation. The Village in the Jungle, (chapter 3) was the first novel by Leonard Woolf, a member (although an atypical one, as the author convincingly shows) of the Bloomsbury group, and future husband of Virginia Woolf. The book, which the author rightly defines ‘an anthropological novel’ (p.4) was largely based on Woolf’s personal experience as a colonial administrator in Sri Lanka from 1904 to 1911. While Ghandi, an indigenous intellectual and reformer, identified in the village the basic unit of a blueprint for Indian development which might bring progress without giving up religious humanism, Woolf’s village is presented as a choir of different voices that overall narrate the moral and ideological failure of the British Empire. 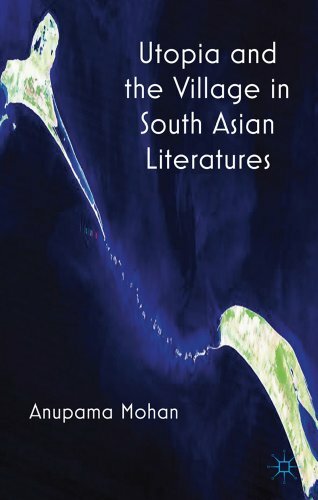 What these two extremely different books have in common, and what constitutes the analytical departure point for Mohan’s discussion of more recent literary works, is the fact that they were both ‘significant in centering attention on the village as strategic to any representation of South Asian collectivity’ (p. 59). The complex heritage of Ghandian utopia in Indian writing, for example, is dealt with in the analysis of Raja Rao’s 1938 Kanthapura. The book, praised by E. M. Forster as the best book ever written by an Indian writer (p. 95), presents the tale of awakening of a rural village in light of Ghandian theories. Using as the main narrator the character of the old widow Achakkaand, the readers follows the village’s demise in the name of Nehruian industrial socialism. This novel presents an interesting case calling for the use of the homotopia/heterotopia continuum rather than utopia/dystopia. Indeed while the utopian soul of Ghandian politics gets eventually lost, what remains unchanged is the fundamentally Hindu social ontology of the political discourse, showing that, cutting across the distinction between traditional and modern, a project of Indian nation building is possible only at the cost of excluding ethnic and religious minorities. In contrast, the Sri Lankan novel The Waiting Earth, authored by Punyakante Wijenaike in 1966, provides ‘a tacit critique of nationalistic utopia’ (p. 159). This is a novel of rural resettling taking place within a historical context (the 1950s and 1960s) dominated by an ethnic and religious homotopia, represented by Sinhalese Buddhism. In what remains ‘a largely negative, bleak, and dispiriting portrayal of rural life’ (p. 151), the author subverts Sinhalese nationalistic imaginary by introducing a subversive representation of women’s role. The decline in the interest of social scientists in the concept of utopia (with a few remarkable exceptions) seems to imply that explorations of concepts and practice related to the notion of utopia tend to be considered irrelevant for understanding and changing the real world. Leaving aside the valuable and informative notions contained in it, the relevance of this volume stems not simply from the fact that much economic, social and cultural life in South Asia takes place in rural villages, where most of the population still lives, but from the fact that, far from being anachronistic elements destined to be swept away from ‘progress’ and ‘modernity’, rural villages have played a multifaceted role in shaping our perception of political scenarios, economic progress and cultural development. Beyond the community of literary theorists, the volume might successfully enrich the perspective of those development scholars who are interested in relating the complexity and the dynamism of the rural village as a vector of social change with its literary forms of representation.